Elssler was born in Vienna in 1810 to a family of artists; her father worked for the composer Joseph Haydn. Elssler's family was very large, so according to Smoak, her parents sent her and her sister Therese to the Imperial School of Ballet so that they could save money by feeding fewer mouths. When she was roughly 16, she was taken to Naples for further study, had an affair with the Prince of Salerno, and became pregnant. Due to his royal status she was unable to marry him, so she returned to Vienna and gave birth to a son, Franz. She immediately gave him up and turned her focus back to her career. "She never felt she gave him the love he deserved; he had a very difficult life," says Smoak. After her success in Naples, she was invited to Berlin to perform, and soon fell in love with a young man her age, and became pregnant again. Next, she made her way to London, where she met a kind woman named Mrs. Grote whose husband was a member of parliament; three months later, the Grotes agreed to adopt Elssler's newly born daughter, though Elssler maintained contact with her. Now, at age 19, Elssler's career took off in earnest. Up until that time, the most famous ballerina of the day was Marie Taglioni. In 1834, Taglioni was the leading prima of the company that is today the Paris Opéra Ballet. The director thought that she was becoming too demanding, and wanted to provide her with a foil. He invited Elssler to Paris and gave her a contract with the company, creating a rivalry with Taglioni. "It was the most important company," says Smoak. "It's what every dancer at the time wanted." Though many believe that Taglioni was the stronger dancer of the two, Elssler's novelty helped her to take off. She found her niche with the Spanish "La Cachucha" variation from the 1836 ballet Le Diable boiteux, and adapted the steps to her liking. "She really hit the jackpot with that dance," says Smoak. "She became so famous in it that people took casts of her foot, made porcelain figurines of her, and chocolates in her name." While Taglioni was known for her ethereality and the quality of her jumps, Elssler was celebrated for her sharp, quick footwork. By the late 1930s, Elssler had a repertoire of ballets, and spent her summers traveling to other cities to perform, much like dancers do with their summer layoffs today. At the time, she was involved with a count she'd met backstage. "He was her so-called protector," explains Smoak. The count had to leave the country, and was nervous leaving her alone, so in 1841 he connected with a producer in Philadelphia and arranged a tour to the U.S. Elssler took a leave of absence from the Paris Opéra, and set sail across the Atlantic with a male partner, a maid and a coachman in tow. When she arrived in New York, she hired a handful of dancers to join her on a tour of three cities: New York, Philadelphia and New Orleans. "People expected her not only to dance 'La Cachucha' but to dance the major ballets she did at the Paris Opéra," says Smoak. "She had to adapt much of what she danced for small spaces, with very few dancers and musicians." Nevertheless, Elssler was an immediate hit. "Audiences went berserk," says Smoak. When Elssler made her way to New Orleans, audiences welcomed her with open arms. Smoak attributes her great success there to the city's origins. "New Orleans was never an Anglo Saxon city," she says. "It went directly from the French to the Spanish to the United States." 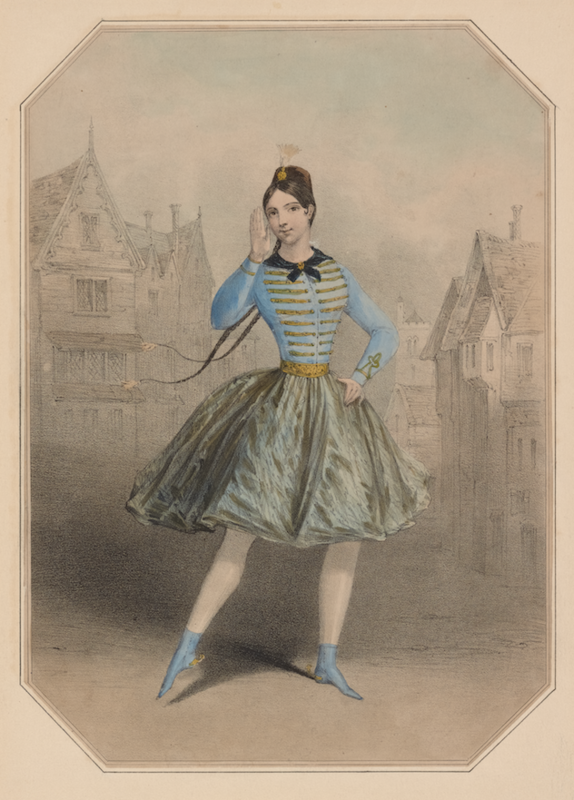 Elssler was popular with both groups: People of Spanish descent were wowed by her Spanish-influenced "La Cachucha," and people of French descent were thrilled to see a dancer from the great Paris Opéra Ballet. While based in New Orleans, Elssler also toured to Cuba and to Washington, DC, where Congress closed so that all of the members could attend her performance. Elssler stayed in the U.S. for a total of two years; after realizing how much money she could make on tour in America (between $500-$1,000 a night; roughly $15,000-$30,000 today), she ultimately gave up her position in Paris. Eventually Elssler returned to Europe, and ultimately retired near Hamburg, dying of cancer in 1878. "Elssler is an incredible symbol of the 19th Century," says Smoak. Happy #ThrowbackThursday!